Designing a meditation room can be an incredibly enjoyable and satisfying process. If you are fortunate enough to have a space that you can dedicate purely to the practice of meditation, then this series of articles will help you to create your very own special sanctuary. Over the years I have always put one room aside in my own house for the purpose of meditation. This room is inevitably the most rewarding to design and decorate, and it usually ends up becoming my favourite room in the house. I must also acknowledge the fact that whenever I attend a meditation class of any type, I always notice the quality and feel of the venue to which I am invited. It makes so much difference when the instructor has taken the time and effort to create a great space in which to meditate. If it is warm and inviting and has a positive atmosphere, then all the attendees find it so much easier to relax and get into the right frame of mind for meditation. These articles have been compiled into a free e-book with loads of additional pictures. Enter your name and email address into the form below to become a subscriber to The Guided Meditation Site. All of our subscribers receive a myriad of free downloads, including a copy of this great e-book. Much of what you read here will be dedicated to helping you create a “look and feel” for your meditation room that will enhance and deepen your experience of meditation. However designing a meditation room, whether it is for your own personal use or for use as a teaching space, is just as much about functionality as it is about aesthetics and atmosphere. A good meditation room needs to meet the needs of the people who use it, and so we need to think beyond simple questions like “what colour will I paint this room?” For example, how will you manage heating and cooling in your meditation room? Do you need to prevent external noise from invading your meditation space? What equipment might you need to enhance your experience of meditation? Other practical issues may also arise that you have not yet thought of. For example, if you will be painting your meditation room, you might wish to use special low-emission paints that will minimize the release of fumes and chemicals into your meditation room. I realize that functional concerns like these might not be as fun to think about as the aesthetics and design of your room, but if they are taken into consideration then you will be more likely to create the meditation room of your dreams. By the time you have finished reading this short book, you should be well on your way to having a clear mental picture of what your room will look like, and you will also be armed with plenty of knowledge about how to make it serve your needs during meditation. Ideally, your meditation room will be a peaceful space that is free from mess and clutter. It will be quiet. It will have a design theme that reflects your personality, and an atmosphere that enhances your mood. It will also be comfortable, not just in terms of furnishings, but also in terms of temperature and lighting, and it should have room for any equipment and accessories that might be needed to help you get the most out of your meditation. So let me walk you through some of the most important factors to consider when designing a meditation room. In this opening section I will describe how to start the design process by developing a room "theme". I will also give you some important information about colour schemes and I'll walk you through the subject of lighting for your meditation room. When designing a meditation room, it's best to start by forming a “big picture” view of what the overall look and feel of your meditation room will be. One of the best ways to do this, even before you start thinking about design elements like colour and furnishings, is to select an overall theme for your meditation room. Once you can describe the theme of your meditation room, you will probably find it easier to make decisions about all the other design elements to follow. You will find yourself designing a room that is cohesive in terms of its overall look and feel, rather than a room that feels disconnected or thrown together. Here are just a few examples of themes for your meditation room. Please keep in mind that these are just ideas to stimulate your own thoughts about how you might like your meditation room to look and feel. Resort style meditation rooms are inspired by the idea of an exotic vacation. Words that spring to mind are “Balinese retreat” or “Day Spa”. Think of a relaxing place where you have been on holiday and try to recreate the look and feel of that place. Minimalistic rooms usually feature light, neutral colour tones and have a very stripped back look and feel about them. Only the bare essentials are catered for in a minimalistic room. This type of meditation room is all about simplicity, serenity and the total avoidance of visual clutter. Lots and lots of vibrant colours! For some people this kind of theme can be overwhelming, but for others it is totally invigorating. You can break all the rules with a rainbow theme...paint different walls different colours, add brightly coloured furnishings, display colourful pictures. The trick is not to stop halfway with a rainbow theme. Go all-out and saturate your meditation room with colour. Cocoon-like meditation rooms are designed to be warm, inviting, enveloping and reclusive. The cocoon effect is best suited to smaller rooms as it is harder to accomplish in a large space. Darker colour tones combined with plenty of natural candle light work very well to create a space that cocoons you in warmth and peace. Quite the opposite to The Cocoon, the Illuminator feels open, spacious and is full of natural light. Bright colour tones combined with plenty of comfortable furnishings and natural cloth combine to create a very pure, luminous space. The Temple theme is inspired by temples, shrines and places of sacred worship. In most cases this is a room that includes plenty of natural elements, like stone, wood carvings, incense and candles. Aztec, Asian or African culture may influence the design. What inspires you? What places make you feel at peace? When you think of meditation, spirituality or relaxation, what places or images come to mind? Let your imagination run free and develop your own personal theme. If you are designing a meditation room for yourself, then your room theme does not have to meet anyone’s criteria but your own. Make it special and uniquely yours. Now that you have a theme in mind for your meditation room, it’s time to begin selecting a colour scheme. When designing a meditation room, there really are no specific rules when it comes to colours, and in many cases your own personal taste will guide you to the colour tones that are right for you, however there are a few important factors to consider. First of all, keep in mind that colour can have a very direct effect on the way you feel. You are probably already aware of this on an intuitive level, but it might surprise you to know that scientific tests have actually proven that after being exposed to specific colours, we experience mental, emotional and even physical changes. Your blood pressure, body temperature and appetite can all be affected by colour, so choose colours that have a positive effect on your overall sense of wellbeing. Just ask yourself, “How do I want to feel in this room?” and then visualize colours that represent those feelings for you. You might like to start by writing down a list of feelings that describe how you want to feel when you walk into your meditation room. You might use words like serene, balanced, relaxed or invigorated, to name a few. Now picture yourself surrounded by the colour(s) you have in mind and observe your response. Does the colour scheme in your mind bring about the right feelings for you? Does it enhance the essence of who you are? Does it fit in with the room theme you have in mind? The colours you choose will have an effect on your perception of space in the room. For example, darker colours may feel very cosy, but they can make a room feel smaller. Lighter colour on the other hand will help to open a room up, but may not have the warmth you are after. Most interior decorators will advise you to avoid the overuse of bold colours, however if a certain colour resonates positively with you, then do not hesitate to defy convention and use as much of it as you like. Not all traditional decorating advice applies when you are designing a meditation room. Keep your desired room theme in mind and go with your instincts. If in doubt about colours for your meditation room, then order a sample of the paint you have in mind and try it out on a wall or two. Have you ever heard of the 60:30:10 design rule? This design rule is a suggested guide to the proportions of colour that you should use in a room: 60% dominant colour, 30% intermediate colour, 10% accent colour. Typically, the dominant colour covers most of the walls, the intermediate colour might be used on one feature wall, and the accent colour might be used just around window frames or on doors. Monochromatic rooms can be a little bland, but rooms with too many colours can be visually distracting. The 60:30:10 design rule is just a handy hint for creating a colour scheme that is nicely balanced. If you are finding colour selection to be difficult, head down to your local paint shop. Most offer free colour charts, free colour scheme suggestions and cheap, if not free sample paints. Many paint manufacturers also offer very helpful online guides which may include free colour selection software and colour scheme advice. If you are concerned about the purity of the air in your meditation room, please consider using low-emission paints so as to minimize the presence of chemical fumes. In a process known as “off-gassing”, paints release small quantities of chemicals into the atmosphere for months or even years after they have finished drying. Low emission paints reduce this effect dramatically. If you intend to use any high-gloss paints in your meditation room, make sure you select a water-based variety. Oil-based high gloss paints look great, but they take days to dry properly and they can smell for weeks afterwards. I have addressed the subject of lighting immediately after the subject of colour because colour and light interplay with one another in a variety of ways, dramatically affecting the way we perceive the space around us. For example, a room that has been painted in warm colours may still seem cold if the wrong type of lighting is used. Likewise, a room may seem smaller or larger depending on the way colour and light are combined. A lack of lighting will make colours seem darker than they really are, and too much lighting may wash out the colours in your room. Light is often divided into two main categories – cool and warm (sometimes referred to as “blue” or “yellow” in tint). In almost all cases warm lighting is the best choice for a meditation room. In case you hadn’t guessed already, candles provide a very warm light indeed, and provide more natural ambience than almost any other light form you can imagine. If you have the choice, avoid fluorescent lighting. Fluorescent light is the coldest, bluest and most sterile type of light. Worse still, large fluorescent lighting fixtures are also famous for “flicker”...the light levels they produce may seem to oscillate ever so slightly, but very rapidly. For some people this can cause irritation and even headaches. I am aware that in some countries, traditional light globes have been prohibited in an effort to reduce energy consumption, leaving fluorescent globes as the only available alternative. Fortunately, most fluorescent globe manufacturers realize how unpopular the cold light of fluorescence can be, and many of them now offer specially designed “warm” fluorescent globes. Both traditional filament light globes and halogen light globes produce a very warm type of light. Please note that blue-tinted halogen globes are available for people who prefer a colder light. Unless this is your preference you should avoid this type of halogen globe...something to keep in mind the next time you are shopping for replacements! The addition of lamps is an excellent way to add more controlled lighting options to a meditation room. Feature lighting like this can be used to add emphasis to one part of your room, and will provide plenty of atmosphere. Salt crystal lamps are a popular choice for meditation rooms these days, but are hardly your only option...why not try using candles in coloured glass holders to cast a vibrant glow about your room? When designing a meditation room, keep the above recommendations in mind and you will be well on your way to creating a room that has great atmosphere and that can be adjusted to suit your needs at any time of day or night. 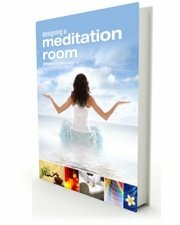 Go to Part 2 of Designing a Meditation Room and find out how to make your meditation room really comfy! Enter your name and email address into the form below to become a subscriber to The Guided Meditation Site. All of our subscribers receive a myriad of free downloads, including a copy of this great e-book.